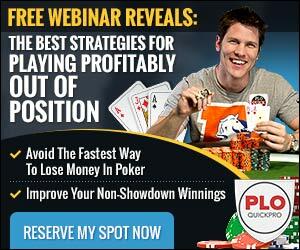 It's your complete collection of PLO preflop and postflop equities. 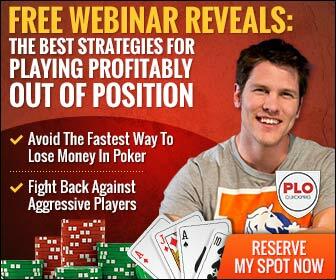 It's perfect for beginners and transitioning players who want to know which hands to stack off with post flop. It clearly displays the profitability of semi- bluffing the turn, and shows you how many outs you need to float profitably. It shows you which draws to invest with, and which to avoid. 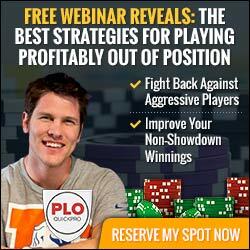 WANT TO WIN MORE MONEY? I’ve helped more than 1000 players master the fundamentals, increase their winrate, and finally move-up in stakes for good. Take this 30 second survey so I can send you a customized blueprint that’s guaranteed to help you achieve your goals in PLO. The 3Bet Test- 3 Key factors for determining the three-bet-ability of any hand. One Secret Hand Selection Factor- that gives you TWO late street profit boosting options. "Lack of Nuttiness” and WHY it is the KEY reason for so many “three-bet or fold” situations in PLO. The 3 groups of “three-betable hands”, and how to leverage them to create profitable situations for yourself. How To 3Bet As Much As Possible Without Getting Caught.